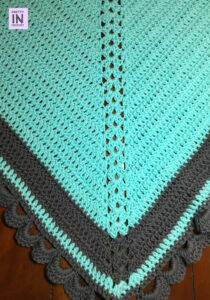 My Blue Grey Lace Shawl is not entirely my own creation. I used a pattern to start off, and then it was such a simple pattern I just started doing my own thing. But first, some background. I bought this gorgeous merino wool from Sugarbush, their Bold line. It’s squishy and cozy and smooth and elegant. Working with it was like working with silk clouds. 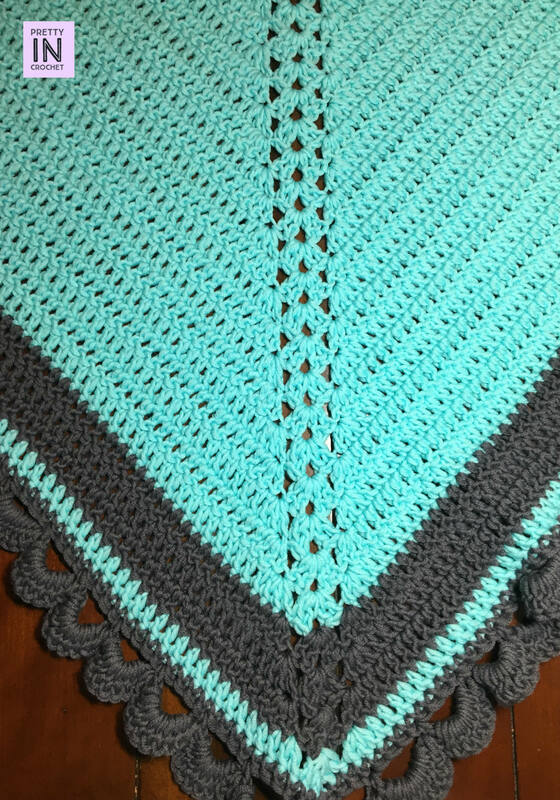 I used Avalon Aqua and Georgian Grey, and I found both at my local-ish yarn shop. Yarn shopping is always more fun there! So what are my own touches? Well first off, the pattern was so easy to follow I stopped counting rows. Opps, but I’m so short I figured it wouldn’t matter as I find most crochet patterns for garments and even shawls and scarves are designed for taller women. This world isn’t designed to accommodate my teeny five feet so I decided to just not count and stop when I thought the shawl was big enough. Then, for the border, I followed the first two rows and then decided to just shell stitch across for the last row. The most important touch of my own of course was using a solid colour for most of this piece, then accenting it with the grey. This shawl is sure to keep you warm on a chilly day, and dresses up a causal outfit effortlessly. Plus, crocheting it was such fun! So grab a hook and get busy crocheting everyone. Myself, I’ve got yet another shawl project to finish hooking up. What’s on your hook of late? I’d love to hear what you’re working on in the comments section.